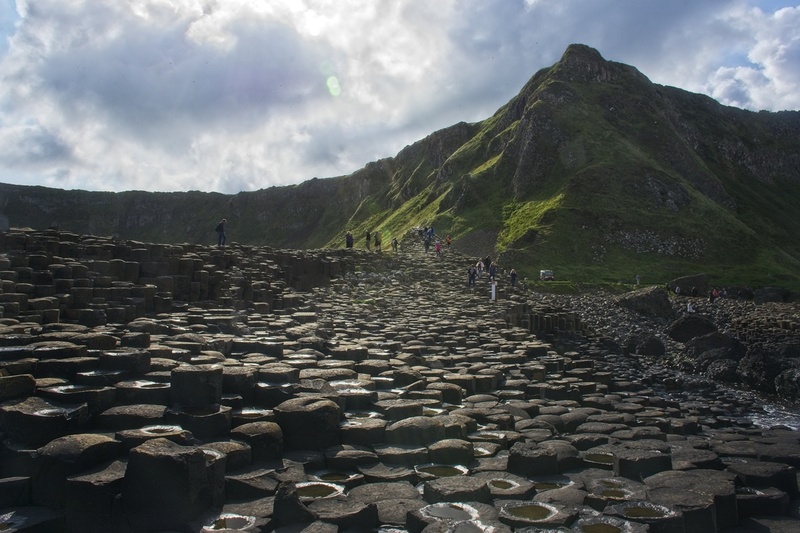 The Giants Causeway is a peculiar land formation on the north coast of Ireland. 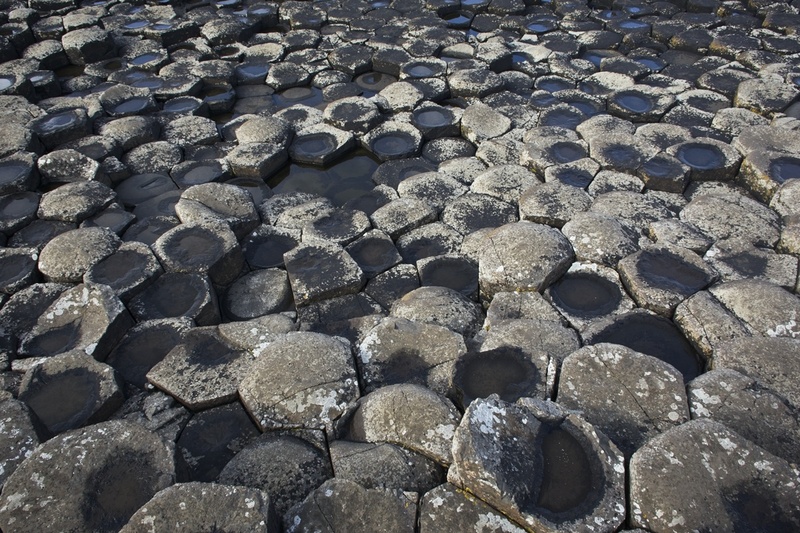 Made up of hexagonal columns of basalt, joined in a way that only a colony of bees or a master of Tetris could emulate; it is an uncommon sight on our planet. Naturally, explaining this curiosity in the days predating geologic science leads to some interesting stories. 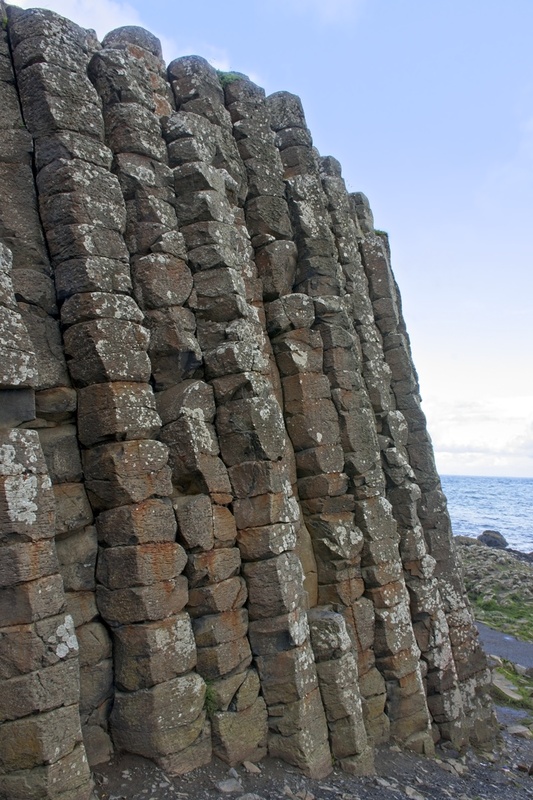 As a similar structure exists across the channel, at Fingal’s Cave on the Scottish isle of Staffa, this could be behind the legend of the Giants Causeway. For those that don’t know, a causeway is a raised road or track across low or wet ground. As the North Sea is very wet ground indeed, it would take a tale of giants to create such a causeway, and giants we have. Once upon a time, there was a gigantic Irish lad named Finn McCool, and an even bigger Scottish lad named Benandonner. Being big burly boys, both gents had rather high opinions of themselves and their ability to thump anyone in a fight. This triggered a bit of long-distance bragging, yelling their boasts across miles of open sea. “Och, you little weakling, the earth quakes when I stomp. 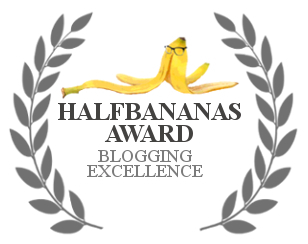 I keep a lighting bolt stashed in my pocket – I flattened it with my fist.” Benandonner had a little sneer on his lip as he tossed that one across. Finn lost his McCool. Scooping up a nearby glob of earth he hurled it at Benandonner, creating Lough Neagh in the process. But his aim was poor, the glob landed well south and created the Isle of Man. And so it went. Each hurling insults and boulders, reshaping the land. Finally, enough was enough. They agreed to meet, face to face, and have it out. At this point the two had not seen each other, they only knew of each other’s reputations and heard the boasts. Soon they would remedy that, but first they needed a causeway to meet. Each started from his own side. 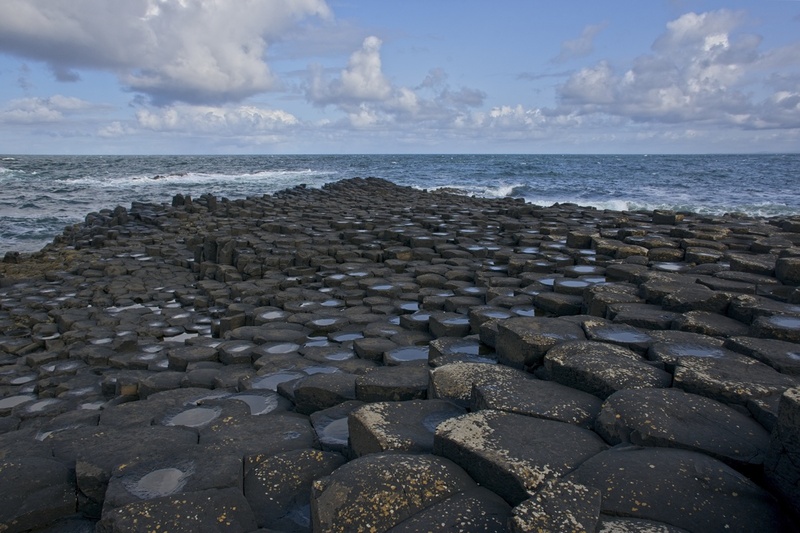 Grabbing up clumps of earth, they squeezed them through strong hands, forming columns of rock and setting them in place. They worked seaward, for weeks at a time, each taking breaks from time to time. Finn, in particular, liked his breaks; he was quite fond of spending time with his wife Oonagh. But the causeway grew. Finally, Finn set the connecting pieces. Looking far off in the distance, he saw Benandonner coming. “God be with us!” exclaimed Finn, “I see the biggest giant that was ever known.” He trembled, turned and ran home. Oonagh made her preparations. First, she made three loaves of bread, but in two she kneaded in her cast iron frying pans. She then took a large pot of new milk, making it into curds and whey, and gave Finn instructions on how to use the curds when Benandonner should come. While she was busy with all this, she set Finn to converting their bed to look like a crib. Finn cast aside his boots and leaped into bed. “That I am, and proud of it,” she replied. As we may have hinted, Benandonner was a large lad, and if there was anything he liked more than a rumble, it was to eat. He gladly accepted. Oonagh made up a side of bacon and a stack of boiled cabbage, and set them in front of the Scot, along with an unusually dense loaf of bread. Oonagh gave Finn a little wink, and Finn let loose with a cry that would put a regiment of bagpipes to shame. 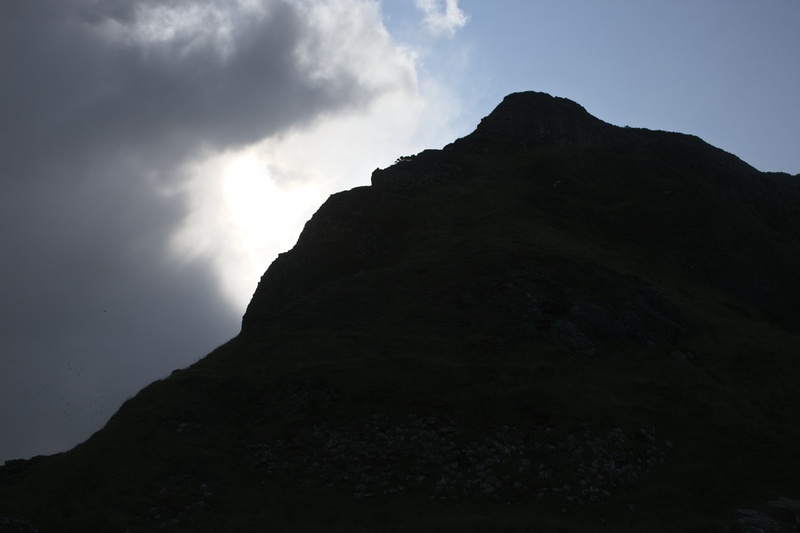 “Gods teeth, what was that!” roared Benandonner. “Twas merely Finn’s child,” Oonagh replied. Oonagh grabbed the loaf of bread without the iron pan, and Finn made short work of it. Benandonner was dumbfounded. “Let me see that child,” he said. He was getting worried. If Finn’s child could eat bread that put Benandonner’s teeth out, what would Finn be like? Then he saw the size of the child; it shocked him. Finn said, “Are you strong? Are you able to squeeze water out of this white stone?” Finn handed Benandonner a chunk of quartz. Benandonner squeezed with all his might, but no water was to be seen. Finn sneered. “Give me that,” said he, and when taking it he swapped it with a fistful of curds. Squeezing away, a shower of whey, clear as water fell. By this time Benandonner was of much the same opinion. Begging Oonagh’s leave he ran in terror for the causeway. And as he returned to Scotland, he pulled up the stone columns that made up the causeway between the two countries, for he was afraid Finn would follow. And as we looked upon the causeway and learned of the legend, we thought of the giants we saw coming in; of their immense size, their arms waving in what some would call an ominous way, and the power they only hinted at. I don’t know if there is an official version of the Legend of Giants Causeway. This certainly isn’t it. For this story, I borrowed a bit from our tour guide, a bit from a couple websites, some details from a story called “A Legend of Knockmany” by William Carleton (1845), and invented a few details of my own. They all share the same bones. I hope you enjoyed it. Sure did enjoy it Dave! Wickedly witty and fun…gosh I love those causeways, and you as a photographer must have been in heaven. 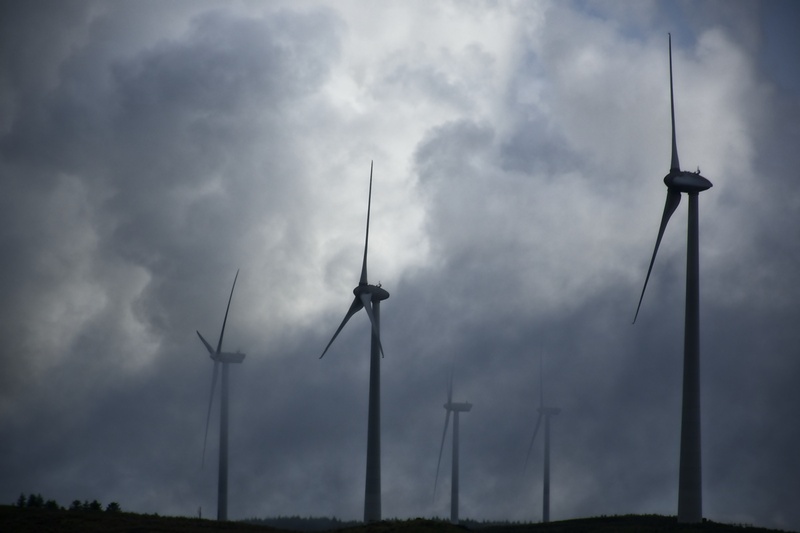 We went to one on the Orkney islands but didn’t make it to Giants, one of my regrets…next time! It is a fun little story, and was fun to tweak it. Before the trip I’d heard of the causeway but not the legend. Hopefully it’s not too long before your next time. That old folklore can be kinda fun! I’m glad I found the “Legend of Knockmany” version. It’s different in a number of ways, but helped flesh out my version a lot. I did get kinda caught up in the story on this one, but yes, there’s a few pictures in this set that I quite like. 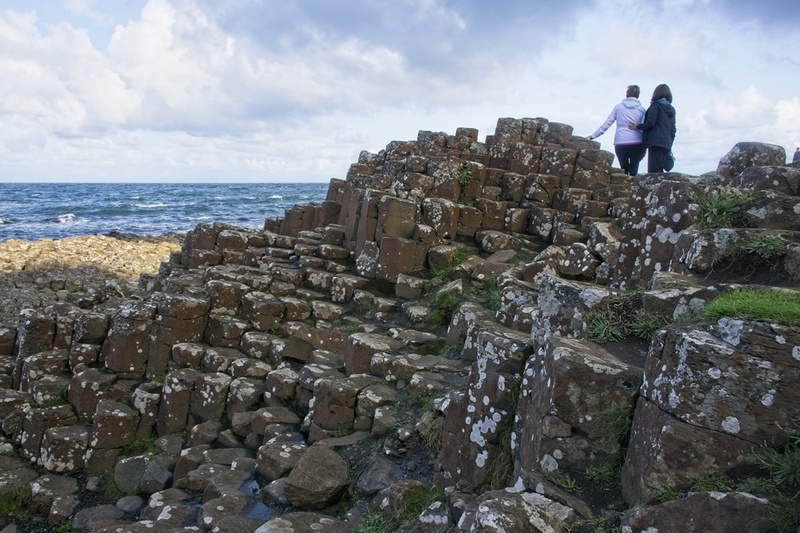 Interesting legend (myth) to explain the curious geologic features of the Giants causeway! Great photos, Dave! Thanks, Peter. Not quite as dry as what you’d hear in a geology class. What an amazing place! It reminds me of some rock formations we saw in Peru that just made no sense had no logic and could not possibly have been made by man as at the time period they were supposedly built, there was no machinery and at any rate, the way those pieces of huge rocks fit together defy machinery. Must be aliens. That’s my theory, myths aside haha. Some of that Inca stonework is amazing, if that’s what you’re talking about. I suppose “machinery” is relative, I’m sure they had ramps and probably pulleys, and a lot of patience and manpower. Of course, from today’s perspectives maybe the manpower was alienpower. But all the Irish needed were giants. Makes much more sense than geological theory, Dave. At least it’s more fun. Enjoyed your version of the old tale. Mrs. Finn was the brains of the operation. That she was. I wonder if Finn would admit to it? So funny you posted this on the very same day I posted my « Once Upon a Time » pièce. Delightful little myth. Giants are always a safe explanation when it comes to rock formations. With as many giants as there used to be around, you’d think we’d be seeing more bones. Or is that what the rock formations are? That is a cool name. I’ve seen different variants of it, for example in the William Carleton version it was Fin M’Coul, but whoever modernised it was on the right causeway. As far as Finn and Paul getting along, who knows? It seems like Finn had a bit of a chip on his shoulder; with Paul that was only a wood chip. The photos are excellent, the third-to-last one, with the hikers there to show scale, is memorable, what a strange sci-fi sight. And the second shot looks a bit like a church organ in a cathedral. “Finn lost his McCool” I may not remember the Scottish giant’s name, already I was thinking Benadryl, but the rest of it, I’ll tell my young cousins around the fire. 🙂 It is a fun story, isn’t it? When telling it to your young cousins, feel free to embelish – I did! It might be worth your while to look up “A Legend of Knockmany” as well, it’s longer and has more details to crib from. I thought the sci-fi look of that one shot was cool too, it was actually the featured photo as well as third to last. Very amusing and well-told story, Dave. After a long career as a geologist, I must admit that I enjoyed your explanation of columnar basalt formation over the old plate tectonic version. Thanks, Joe. That bit was one of my little inventions – maybe I should take up geology! 😉 I thought about including the real reason behind columnar basalt, but it wasn’t as fun and the post was running long as is. For what it’s worth, I’ve seen columnar basalt here in the Northwest, but it’s generally embedded in cliff walls – you don’t see the top. And I don’t think I’ve seen it on the coast. Too far from the subduction zone maybe? With your knowledge of subduction zones and penchant for drinking beer, you would make a first-rate geologist. Excellent story and very cool formation, too. I feel like I’ve seen smaller versions of these basalt columns (Iceland maybe? ), but I can’t remember if I’ve seen this causeway! That sounds like I’m an eejit, as the Irish would say, but I was there so long ago, I can’t remember if I saw this in person or just read about it a lot. Thanks for the refresher view either way! I’ve seen columnar basalt here in the Northwest, but generally it’s embedded in a cliff face – you only see the sides, not the top. Chances are you’ve seen something like that too in your various travels. A fine version of the tale. Definitely preferable to the geological one. It is an interesting subject. And the traditional tales of how things came about are just as much so with their insights into human behaviour . Brains over brawn. Plus Oonagh has no need to fear that the Scots giant will take his frustration out on her. Beautiful place to visit. When the tide is out the causeway is quite long. I think I read somewhere that it’s the most popular attraction in Ireland. Clearly, there’s good reason for that. If there’s anything better than traveling vicariously, it’s being reminded of actually being there. I’m glad it brings back good memories for you. 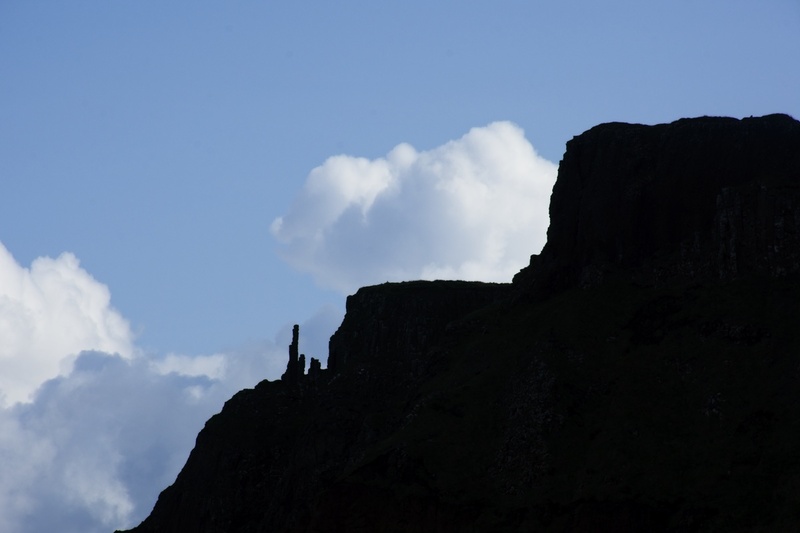 Stunning photos of the Giant’s Causeway, especially the third image from the bottom. Excellent photography. What Joe says about geologists and beer is true. My son-in-law is a geologist and he says the same thing. He claims geology conferences are excuses for beer bashes. It’s possible to see the tops of columnar basalt locally. There are places where you can get to them in eastern Washington, in the scablands and the coulees made by the Missoula floods, though I haven’t found them yet. I’ve also seen pictures of the top of Devil’s Postpile in the Sierra Nevadas. These hexagonal forms seem to appear in nature regularly, which I find pretty amazing. I figured there must be some column tops showing somewhere, but I haven’t gone looking. I’ve heard the Palouse area of eastern Washington is scenic, maybe a trip out that way could go through those coulee areas. There are some aspects of geology that are pretty mind-boggling, but I haven’t studied it enough to understand them. Loved it! I was also trying to read it with an Irish or Scottish accent, even though the latter is easier, to me, than the Irish. Thanks for the read, Dave! Great. We visited the causeway and knew there were folk stories but heard none of them. Glad you enjoyed it – or at least my version of one. 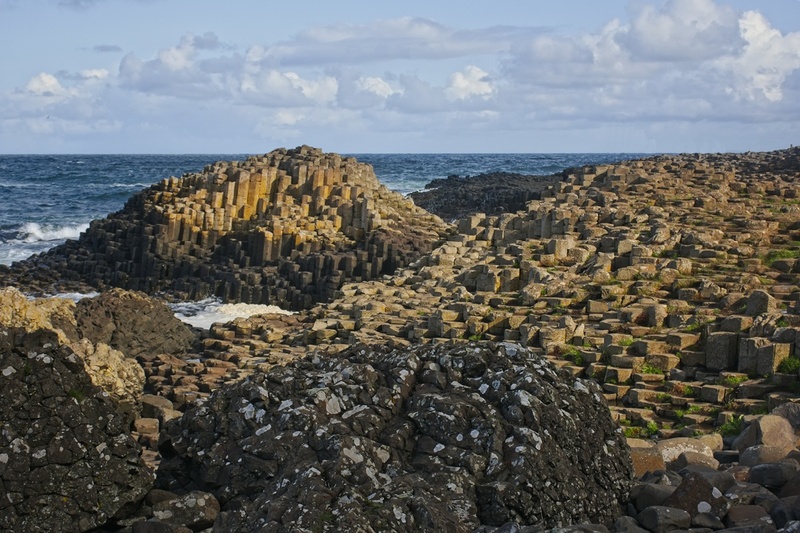 Those basalt formations at the Giants Causeway are as from a different world, strange and interesting. Your captured their peculiar forms beautifully in these photos. Thanks, Otto. It’s a strange and wonderful world, in many ways.